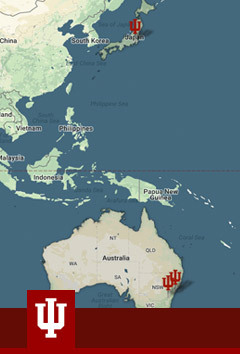 University collections are vital tools for scholars and scientists from nearly all disciplines. They inspire students and are vital parts of their learning and understanding. And they draw people from beyond the university to view and study them. They have been accumulated, in some cases, for centuries, and can contain unique and irreplaceable material of enormous value. Though not always thought of in these terms, they can be among an institution’s most valuable resources. On Tuesday in Tokyo, members of the IU delegation headed to the Japan headquarters of Sony for a lively and productive discussion of the technologies being used – and those still in the process of being developed – to preserve and ensure greater access to the university’s most precious resource: knowledge. The creation of knowledge through research and innovation. The dissemination of that knowledge through teaching and learning. The preservation of that knowledge. For many years, the last of those missions was almost exclusively the license of libraries and museums. But in today’s digital age, however, the preservation of knowledge – including books and journals, as well as collections of other objects, such as paintings, photos, prints, sculpture, sound and video recordings, and scientific data – no longer depends as much on place. Now, as IU President Michael A. McRobbie has noted in recent speeches on the subject, vast amounts of materials can be made – indeed, are expected to be made – instantly accessible, sharable and transmittable over the internet to students and scholars across the world. Delegation members from IU with their counterparts from Sony at the company’s corporate headquarters in Tokyo. IU’s extensive collections contain material from a wide range of disciplines, including the humanities, arts and music, social sciences and health sciences — all areas of traditional strength for the university. A comprehensive study in 2009 estimated that there are well over half a million audio and video recordings and film reels on the IU Bloomington campus alone, to go along with another 100,000 or more objects of significance on the Indianapolis campus and on IU’s five regional campuses. The challenge facing IU and other keepers of major legacy collections is how to best manage the digital storage of large amounts of accumulated material, which are often vast in size and scope, and fully maximize their usage by the broadest possible audience. Fortunately, IU finds itself ahead of the pack when it comes to digital preservation, thanks in large part to successful and innovative partnerships like it has with Memnon Archiving Services, a Sony Group Company. Few movie fans and scholars around the nation likely know that IU possesses one of the largest and most diverse collections of motion picture film at any U.S. college or university. Through the IU-Memnon collaboration, many of those films are now preserved for future viewing and study. The IU-Memnon partnership dates back to 2013, when McRobbie announced the creation of IU’s Media Digitization and Preservation Initiative during his annual State of the University address. The goal of the ongoing initiative is to digitally preserve and provide access to all significant audio and video recordings on all IU campuses by the university’s bicentennial celebration in 2020. After conducting a global search of the best solutions in digital preservation, IU selected as a project partner Memnon, which Sony subsequently acquired in 2015. With its industrial-scale digitization process, and when operating at peak performance, Memnon can process up to 600 recordings in a day. By last spring, the Media Digitization and Preservation Initiative, which is in the Innovation Center on the IU Bloomington campus, had outpaced its own timeline projections, with 250,000 priceless audio and video recordings already preserved for future generations of scholars and students. 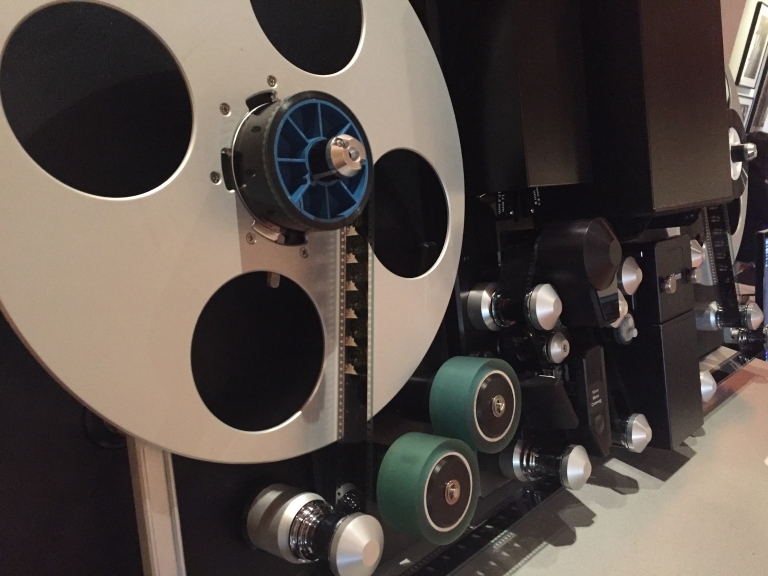 Film digitization scanners are being used by Memnon, a Sony Group Company, to preserve IU’s collection of film reels, one of the largest and most diverse collections of motion picture film at any U.S. college or university. What’s more, IU’s partnership with Memnon, now in its second phase, has further cemented the university’s status as a worldwide leader in high-volume digital preservation, storage and access — one that, in recent years, has entered into a number of other successful digital collaborations with, among other organizations, universities, commercial broadcasters and museums. For example, in 2016, IU announced a cooperative agreement with the renowned Uffizi Gallery in Florence, Italy, to carry out the 3-D digitization of the museum’s entire collection of 1,250 pieces of irreplaceable classical Greek and Roman sculpture. The project between the Uffizi, one of the oldest and most visited art museums in the world, and IU’s Virtual World Heritage Laboratory is creating high-resolution 3-D digital models of the Uffizi sculptures and is making them freely available online. It, too, is expected to be completed by the IU Bicentennial. Today at Sony headquarters, McRobbie met with a group of leading Sony executives to discuss how to further strengthen the successful IU-Sony relationship and pursue opportunities for future technical collaboration that would enhance classroom learning, enable greater student success and support the innovative work of IU teachers and researchers. McRobbie also shared a number of developments at IU, including the addition of several new schools and academic initiatives, such as IU’s new degree program in intelligent systems engineering, the first-ever engineering program at IU. The program, offered through IU’s School of Informatics, Computing and Engineering, is focused on the development of small-scale, networked and mobile technology — areas in which IU has long been a leader. Accompanying McRobbie at the meeting were IU Vice President for Information Technology and Chief Information Officer Brad Wheeler; IU Vice President for International Affairs and trip organizer David Zaret; Lee Feinstein, former U.S. ambassador to Poland and dean of IU’s School of Global and International Studies; and Media Digitization and Preservation Initiative Executive Director Dennis Cromwell, each of whom contributed to a productive and spirited morning session. During the session, the senior IU leaders were asked by their Sony counterparts for their thoughts and insights into how new Sony technologies might best translate into opportunities for more dynamic, active campus learning environments. They also were treated to a showcase of Sony’s newest and most innovative market technologies, which sparked a number of possible ideas for new collaboration, suggesting that IU and Sony may just be scratching the surface of what has already been a most inspiring, innovative and productive partnership. Inspiration of a far different kind was on order Tuesday evening when members of the IU delegation joined several distinguished guests for a special musical performance – one featuring a couple of major IU connections – at the Tokyo Metropolitan Theatre. IU alumnus and world-renowned conductor Robert Ryker, who is music director of the Tokyo Sinfonia and music director of the National Philharmonic of India, conducted a stirring performance of Ein Deutsches Requiem by Johannes Brahms, marking the 500-year anniversary of the Reformation. Recent IU Jacobs School of Music graduate Johann Schram Reed, performing in Japan for the first time after receiving critical acclaim for his appearances in various operas along the West Coast of the U.S., served as one of two featured solo vocalists for the concert. IU President Michael McRobbie, left, with Her Imperial Highness Princess Takamado of Japan and IU alumnus and world-renowned conductor Robert Ryker. Backed by the Tokyo College of Music’s large symphony orchestra and chorus – as well as a massive pipe organ that, amazingly at one point, rotated appearances (starting off Baroque, then shifting to a more modern, industrial-looking side) – both IU alums delivered emotionally powerful performances. 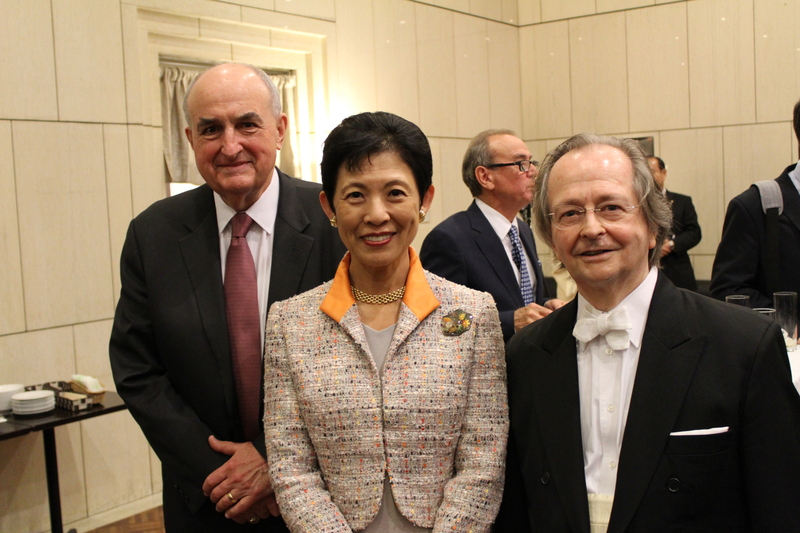 For their impressive efforts, they received a lengthy standing ovation from a packed audience that included, among other guest dignitaries seated with McRobbie, the ambassadors to Japan from Austria, Germany and the Holy See, as well as Her Imperial Highness Princess Takamado of Japan. It was a moving celebration of a historic and harmonic event, and, in keeping with the day’s earlier theme, a performance absolutely worth preserving.